Nintendo Wii is not a high-definition video console. Unlike the current generations of Xbox and PlayStation, the Wii doesn’t support a 720p or 1080i/p video output. You’re limited to standard-definition 480p — though you can at least select a widescreen output (16:9) to fill your HDTV’s screen. There are a lot of good things about the Wii. First is the Wii’s motion-sensing control system. The Wii comes with a matched pair of wireless (Bluetooth) controllers known as the Wii Remote (all the cool kids call it the Wiimote) and the Nunchuck. These controllers include special sensors (both optical, using infrared signals, and mechanical, using special miniature sensor chips called accelerometers). These sensors can tell where your controllers are pointing and which way they are moving (and even how fast they are moving). So instead of getting a sore thumb trying to hit all the little buttons on a traditional gaming controller, you just move the controller through the air to control the action on the screen. Yes, there are still some buttons, but for most games you’ll need to use only a few of them. If you’re new to gaming, the Wii is your friend. Built-in Wi-Fi networking: You can easily connect to your home network and broadband connection for online gaming. Built-in solid state (flash) memory: Store game information, photos, and more. A memory card slot that accepts SD cards: Use this for adding additional memory to the console and for displaying photos on the screen. Two USB ports: Use these ports to connect devices or for additional memory. Some serious horsepower under the hood: The Wii has an IBM Power PC CPU and an ATI “Hollywood” graphics chip. The Wii doesn’t play DVDs. The Wii uses optical discs for games, but they’re a special proprietary type. You can’t play DVDs on a Wii (though this feature will be available in future models). The Wii doesn’t support Dolby Digital or DTS. You have to make do with Dolby Pro Logic II surround sound. 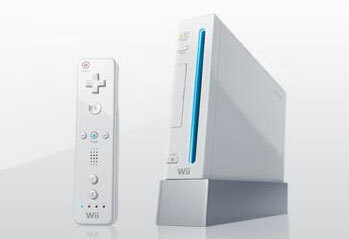 The Wii is not only cheapish but also tiny, about the same size as three stacked DVD cases, so it will fit into your home theater room without taking up a whole shelf on your rack by itself.